One of my favorite activities is feeding visitors, and i just had a nearly perfect one, my friend Tommy from South Carolina. And yeah, yeah, we know all about South Carolina, but Tommy’s different. In the first place, he’s a great visitor in that he can take care of himself. Just show him his bedroom and where the towels and toilet paper are and he’s fine. More importantly, he can go out adventuring on his own while i take naps in the daytime and sleep at night with my bedroom door closed so that he doesn’t wake me when he comes blundering home in the wee hours. But more that all that, he’s a discriminating gourmand who likes almost everything and loves being introduced to new restaurants. Wonderful. So what did we do? His first night here was non-negotiable. I took him to Company and he loved it, which was no surprise. We had that spectacular corn soup and the confit chicken wings. He had the swordfish and i had a half order of the capellini since i’d been dying to try one of Karen’s pasta dishes. Both were superb, and Tommy was blown away by the swordfish. For dessert he had the peach crumble and i succumbed to the chocolate brownie with vanilla bean ice cream. What a fine start for his visit. For lunch the next day we went to the Anchor Oyster Bar, where he loved the crab cakes and i wallowed in the cioppino, both of which being routinely rated as the best in San Francisco. And hey, i just discovered an online recipe that attempts to duplicate the Anchor’s cioppino, and i very well may have to try it myself, especially since Roseann keeps jacking the prices up so that the place is slipping out of my grasp. 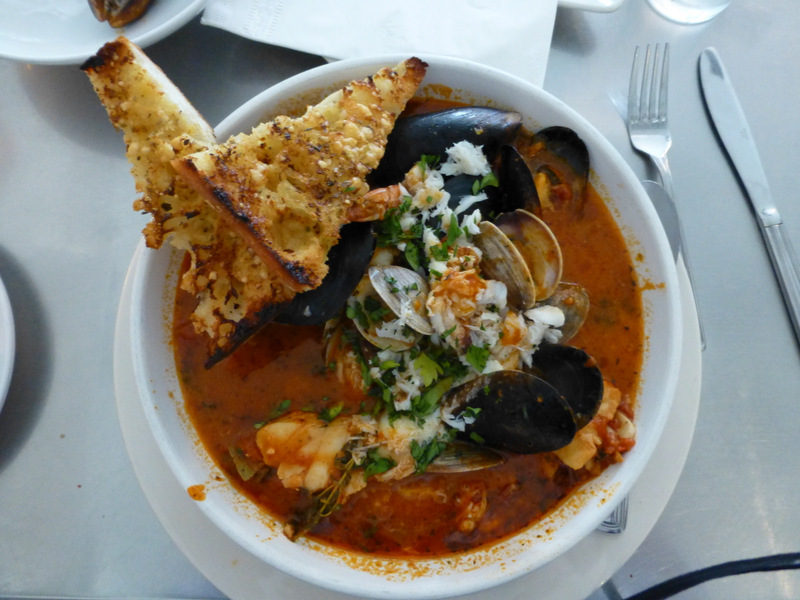 Here’s the cioppino at the Anchor Oyster Bar. That night neither of us was really hungry, so i just fed him stuff i had in the house, mainly a slice of that whole wheat bolani from East West Foods at the Castro Farmers’ Market. To amp it up, i topped it with slices of aged Gouda and black sesame seeds and stuck it in the toaster oven. Served it with a couple of fine yellow nectarines from Rodin’s. Then we took a break for a few days while Tommy went off to a retreat, and when he returned we started right back up with a lunch at Holy Kitchen, this new Indian place on 24th Street that’s open for lunch and dinner. Well, i wanted to take Tommy to Aslam’s Rasoi where i knew the food was delicious, but it’s not open for lunch. I wanted to like Holy Kitchen, and i have to admit that it’s a very pleasant space with quietly austere decor and a charming waitress. I had the tandoori chicken, saag paneer, naan, and chai. The chai was excellent, but the rest was merely good and alas, that’s not good enough for me. For Tommy’s last night we went to the Mission Beach Cafe for their excellent rabbit gumbo and their ineffable truffle oil Parmesan fries…and split that fabulous chocolate cream pie for dessert. And for lunch on the day of his departure, it was Yank Sing. Whew. So yes, Tommy tucked right in for some fabulous dining. I’d said before that he was nearly perfect, but now i’ll tell on him. He has one flaw. That night i was feeding him delicacies out of my refrigerator i offered him something extra special i’d prepared the week before, some fresh baby squid i’d lovingly pickled. He turned his nose up at it. Hell, he wouldn’t even taste the tentacles, the best part.